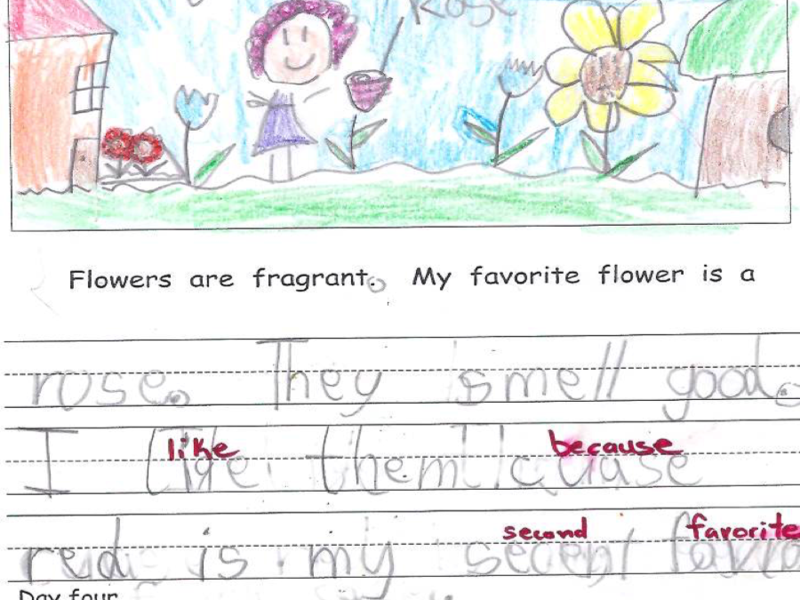 Writing instruction at the kindergarten level can be one of the most joyful–and challenging–experiences for a teacher. We witness bursts of thoughts, views, and emotions in our classrooms on a daily basis, but encounter difficulties in helping our students put their ideas onto paper. Some weeks are frustrating, with seemingly little progress. But slowly, our emerging writers begin to write words and draw pictures on their pages. Over time, they become comfortable in expressing their ideas–composing sentences and stories along the way. Their confidence grows as they revel in sharing their stories with their classmates. By the end of the year, a classroom transformation has taken place! Here are some vignettes into the stages of kindergarten writing instruction taken from a few schools using our program. While each journey is different–and each student has their own unique needs–we encourage teachers to follow a sequential and systematic process. The early stages of kindergarten writing instruction can consist of forming letters, associating sounds and words with those letters, and drawing simple pictures to represent those words. 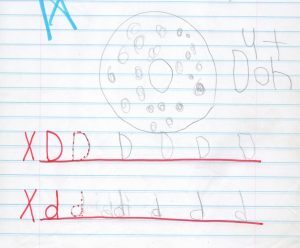 Here is an example taken from early fall where the student is learning to write the letter ‘D’ neatly in a row and has associated the word doughnut with it. The middle stages can include cloze procedures and sentence practice, complemented by drawing exercises to portray the subject sentences. 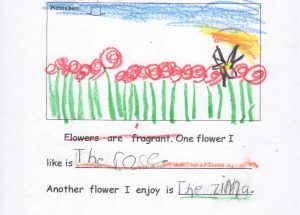 In the following example taken from the middle of the school year, the student is expressing her admiration of roses and zinnias, and has drawn a beautiful meadow of roses to describe her sentences. 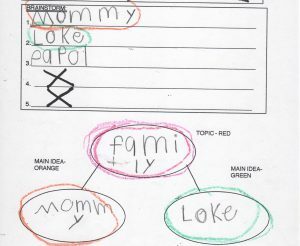 The final stages can involve prompt-based writing for simple topics such as favorite pets or colors. 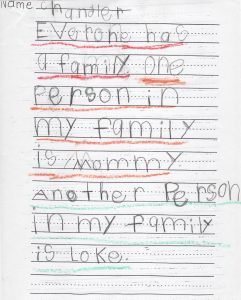 In this example taken from early springtime, the student has organized a web to describe his family and has written a three-sentence paragraph on his family. The next stage would involve providing details on his family members–such as reasons why they are so special or hobbies that they may have. Enjoy your journey with your students and send us some of your stories so we can share them with other educators. Join the Writing Revolution that is taking place across the country!